What Are The Types Of Licenses Offered In Arizona? Getting your drivers license is a vital part of growing up. Whether you’re in your teens or are approaching 50, the freedom and independence offered by that small piece of plastic is unparalleled. Though many people never seek to obtain driving lessons beyond that initial, basic certification, there are many other classes of licenses offered by beginner driving schools across the country. The levels and what they describe vary from state to state, so we’re going to be taking a look at what other options are available in sunny Arizona. Classes A through C: Class A, B, and C licenses are each considered commercial drivers licenses (CDL) and are organized based on weight. Class A is required to operate any combination of vehicles with a gross combination weight rating (GVWR) of 26,001 pounds or more; Class B is required to operate a single vehicle with a GVWR of 26,001 pounds or more; and Class C is required to operate a vehicle designed to transport 16 or more occupants or hazardous materials. In Arizona, these classes must be renewed every five years. Classes D and G: Your average drivers license is usually considered a Class D licenses. The actual definition for D and G classes is for the operation of a single motor vehicle with a GVW rating of 26,000 pounds or less. Class G licenses indicated that the driver at least 16 years of age but less than 18. Class M: This class describes your ability to operate a motorcycle or moped, and can be endorsed on a valid class A, B, C, D, or G license. As you can see, driving on America’s great and sprawling roads doesn’t end with a simple Class D license. Fortunately, driving classes for beginners are offered at all levels; not only will you learn techniques that will keep you safe (the fatality rate for drivers age 16 to 19 is four times that of drivers age 25 to 69 years), but you’ll be able to broaden your horizons and explore new career options. Whether you want to learn to drive big tractor-trailer trucks or are simply looking to burn rubber on a motorcycle, there are plenty of traffic lessons at your disposal. Don’t wait; contact Driving Arizona for driving classes for beginners today! Learning how to drive is a vital part of growing up. From the moment you get behind the wheel, you understand both the freedom and the fear involved in controlling a multi-ton vehicle. Depending on the preferences of your parents, you gained experience on one of two types of vehicles: automatic or manual (also known as stick). Though automatic cars have their benefits, here are three reasons why you should learn to drive a stick shift. Fuel Economy: Automatic cars run themselves. When it comes to sharp turns, straightaways, and long curves, they decide what is best for your vehicle. However, they might not be correct; because a machine is behind the decision-making process, it isn’t uncommon for extra fuel to be spent. By understanding how your engine runs and when it needs to be shifted, you can prevent the wastage of fuel — and money. Better Control: Manual cars not only control how much fuel you’re using, they manage engine power in general. When driving classes for beginners teach you how to accurately and efficiently control the power running between your engine and your wheels, you are better able to control that mass of metal and electricity in bad weather and other low-traction situations; there’s no waiting for the computer to take over. The Advantage: Despite what you may think, not all cars are automatic. This may not be a problem currently — after all, you wouldn’t buy a car you couldn’t drive — but it could come up in the future. Whether you have a roommate who wants you to move their car so they don’t get a ticket or you want to make the leap to classic cars, you still need to have the skills to drive them. When it comes to driving classes for beginners, most get their experience driving manual vehicles; the simplicity allows drivers to exclusively pay attention to the road and how it feels, rather than the complexity of multiple gears and the role they play on the road. That being said, anyone who has gone through beginner driving school should learn the more technical aspect of stick shift; whether you live in the country (where statistically you will drive more miles, around 12,264 annually) or in a bigger city, knowing and understanding both can only help. With over 200 million licensed drivers in the United States, and with around 86% of workers using a car to commute to work in 2013 alone, it is understandable why driving courses are considered a necessity by many. Whether you are an adult looking into courses for yourself or you have a teen that needs to enroll, driver education is important to look into. Learn more about the benefits of signing up for some driving classes for beginners below, then talk a representative here at Driving Arizona. We are eager to ensure you get the drivers training you need to keep our roads as safe as possible. A big reason we suggest driving classes for beginners is that people with inexperience behind the wheel often underestimate how many dangerous situations they could face. Just because you are doing everything right, does not mean other drivers will be, too. You could easily come into contact with someone who is distracted by their phone, driving while intoxicated, or being reckless, in which case you will need to know how to appropriately react. Driving lessons teach you a lot about what to do in these scenarios, so you are prepared, no matter what. It is always better to learn to drive the right way, rather than have to retrain yourself down the line. Along with this, you will learn how to drive in all types of weather, as well as how to react when you come across debris or obstructions in the road. It is important knowledge everyone should know. Work with us to get the tips you need to keep yourself and others safer every single day. When you practice driving with a qualified instructor, you gain the confidence you need to drive anywhere. Whether it is a dusty gravel road, a busy highway, or stop-and-go city traffic, you need to be prepared for anything, and taking a beginner driving course is a surefire way to do it. Gain the peace of mind and confidence you deserve by signing up today. If you and another vehicle come to a four way stop at the same time, who goes first? How early should you put on your turn signal? What do the different lines on the road mean? These questions, plus countless others, are ones drivers face every single day, and you would be amazed at how often experienced drivers get stumped when asked about simple driving rules. Driving school allows you the opportunity to learn all of the ins and outs so you are prepared for any traffic situation you come across. Plus, you can educate your friends and family on things they may not know the answers to. It is a win-win all around. When you enroll in driving classes for beginners, it could make all the difference in getting you more comfortable on the road. Contact us today to learn more about starting your journey with our team! When it comes to driving, nothing is more dangerous than distractions. Though food, drink, music, and people certainly fall into that category, texting and driving is one of riskiest things you can do when you’re behind the wheel of a car. You’re not only thinking about something else — looking at a picture you just received, reading a message, or sending one yourself –, but you’re also not looking at the road. The combination of these two can be deadly under the right conditions, so let’s take a look at the risks that accompany texting and driving. Exponential chance of a crash: If you want to become 23 times more likely to be in a crash, texting and driving is the way to do it. Not only that, but distracted driving plays a heavy role in accidents where injuries occurred. Don’t take the risk; put the phone down. Put it into perspective: It takes approximately five seconds to send a text. If you’re traveling at 55 mph and take your eyes off the road for that short amount of time, you’ll have driven the length of a football field without looking at the road. A lot can go wrong in such a long distance. No one is safe: Teens represent a lethal cocktail of inexperience and phone addiction that makes them four times as likely to get into crashes due to cell phone distractions than older drivers. However, that doesn’t mean adults aren’t also guilty of the same crime. Whether you’re 16 or 56, leave your phone alone during the drive. It’s estimated that the average American drives 29.2 miles per day — to and from work — totaling 46 minutes of driving time. Although it may seem benign to pick up your cell phone during this period, especially when traffic is slow and you find yourself getting bored, the reality of the situation is quite the opposite. Drivers ed classes provide excellent tools for concerned parents and distracted teens; not only will you both learn how to avoid turning to your phone, but you’ll gain experience on the road. Since inexperience is such a factor in accidents, beginner driving school can turn the tide. Whether you live in the frigid northeast or sunny Chandler driving classes are available to teach you how to be a safe driver. If you’re interested in the many Chandler driving classes available through Driving Arizona, give us a call today. Everyone who has obtained their license remembers the thrill of finally being able to set out on their own. The freedom and independence that drivers licenses grant are unparalleled in life, at least from a teen’s perspective. Unfortunately, it can be a little too tempting in the beginning: in their first year on the road, teens are nearly 10 times more likely to be in a crash. This is precisely why parents must be involved through every step of the learning process. Kids have always learned by watching — it’s one of the reasons they mimic behaviors as toddlers. This is why practicing safe driving skills yourself is an excellent way of teaching your children. As their first lesson on the road (even if they’re unaware of it), you’ll be demonstrating how a safe and responsible driver acts. Before long, they’ll have picked up the habits themselves. Once your child has gotten their learners permit, they’ll need to complete a certain number of supervised driving hours. Try to resist dropping them at a drivers ed school for the majority of this time; instead, view it as an opportunity to learn and grow together. Do your best to be calm and provide constructive criticism, and your relationship will get stronger alongside their driving skills. When your child finally gets that elusive license, you have the right to set limits on it, at least until you’re more confident in their abilities. For example, no driving past sundown, in bad weather, etc. Be reasonable in your restrictions and let them drive as much as possible, especially if you have the opportunity to be a passenger. The urge to simply sign your child up for drivers ed classes, or drop them off at a beginner driving school, may be strong (after all, the idea of your baby behind the wheel of a car can be quite scary), but your involvement is crucial to their safety. Whether you live in the snowy northeast or a sunny city like Chandler drivers ed classes can only do so much. 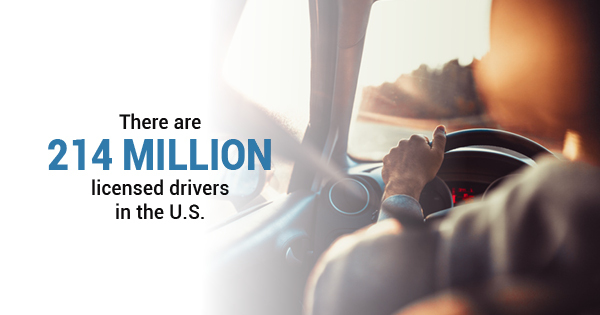 It is parental support, encouragement, and reinforcement that truly teaches young drivers how to handle being a part of the 214 million drivers in the country. From Glendale to Chandler drivers ed classes are available through the Driving Arizona Driving School. Give us a call at (480)681-1751 today. On average, Americans drive the least during the winter months (up to 25.7 miles daily). But spring is just around the corner and many new drivers will soon be getting behind the wheel. One of those new drivers could be you. Drivers ed classes are for teens. Many teenagers take driving classes because they can’t wait for the independence that driving offers. But there are many adults who take drivers ed classes, too. Whether it’s because you’re new to driving or because you want to refresh your skills on the road, driving classes are for everyone. Driving classes have a long lecture before you get on the road. It’s true that driving classes have a large amount of classroom time, but it’s usually interspersed with driving time. When a student practices what they’ve learned immediately after they’ve learned it, they’re more likely to understand the relevance of that information. You don’t need to learn how to drive defensively if you’re responsible. Even a responsible driver can get into an emergency situation. You’re not the only person, or the only thing, on the road when you drive. That’s why driving schools offer defensive driving classes. You’re a responsible driver when you know how to react in an emergency situation, not because you’ve never been in an emergency situation. You only need to be behind the wheel for six hours. In some states, six hours behind the wheel with a professional instructor is considered adequate driving practice. But in many other states, you need 40 hours of practice behind the wheel. You also need to practice without a driving instructor. This is where your driver’s permit comes into play; you can practice with your parents or another licensed driver in the passenger seat. Where can I find Chandler driving classes near me? Up to 56% of teens rely on their parents to teach them how to drive. But your parents might not have the time to teach you so you can get your license. That’s where Chandler driving classes come in. Whether you’re looking for Chandler driving classes or a Phoenix driving school, Driving Arizona has multiple locations so you can learn to drive safely wherever you are. For more information on our drivers ed classes in Arizona, contact Driving Arizona today. Learning to drive is an essential part of growing up. For an estimated 56% of teenagers, their parents are their teachers; weekly traffic lessons occur after dinner, or after school, to ensure they’re getting the practice driving they need to ultimately obtain their license. As fun as time with mom and dad might be when you’re watching a movie together, however, the added pressure of teachable moments inside two-ton vehicles racing down the road can turn a learning experience into a nightmare — for all parties. Here are three ways both parent and child can prevent that from happening and make it through driving lessons. Stay calm: You can both learn from this experience; teens should focus on being safe and maintaining control of their vehicle, while parents must be able to calmly help them through mistakes to aid the learning process. Parents, try to resist the urge to grab the handle or dashboard after every acceleration, or force your foot down on your imaginary break — it’s not helping the situation. Focus on the driving: It can be easy to get caught up in chatter, especially if you’re just roaming around your town’s backstreets or cemetery while your child learns the ropes. Rather than discussing work or school, discuss how to spot potential hazards, or different ‘how would you react’ scenarios. Communicate, not criticize: Stress is inevitable when you’re an inexperienced driver, and many parents tend to let their emotions — of concern — get ahead of their mouths. Both parties should focus on clearly stating the problem: instead of ‘you always drive too fast,’ explain that you’re scared of potential accidents; instead of ‘you’re always yelling at me,’ explain that it makes you, as the driver, more stressed out. Drivers between the ages of 16 and 19 experience a fatality rate four times higher than those of adults (age 25 to 69), perhaps explaining the reason your mom always panics when you go a little bit faster than the speed limit. However, it is vital that you both work together — calmly and with constant communication — to ensure that the entire practice driving experience isn’t stressful and unbearable. If your efforts simply aren’t working, or you feel that you need a more comprehensive education, drivers ed classes offered through beginner driving schools are always available to help. Should I Learn To Drive With My Parents Or With A Driving Instructor? The ability to drive opens up a world of limitless possibilities to teenagers. When you’re no longer reliant on your friends and family members to take you places — whether they’re work-, school-, or fun-related — you realize how much freedom you have. Although cross-country road trips at the age of 16 might be off the table, you can still experience life without a chaperone. However, you have to obtain your license before you go tasting that sweet open road, and that begs the question: should you trust your parents or a professional driving instructor to teach you the ropes? Let’s take a look at the pros and cons of each. Your parents have taught you pretty much everything you know in life, so it seems natural to go to them for such a big change. You’ve already developed a trustworthy relationship, making driving lessons — especially those on faster roads — much less anxiety-inducing; in the same vein, you won’t need to worry about sharing a vehicle with five other students who are watching your every move. Because your parents have extensive practice driving, they’ll be able to share the basic rules of the road (including any pertinent or vital information, like traffic laws and signage meanings) with you. However, as much as they may act like it, parents don’t know everything. They may share outdated or incorrect information during your traffic lessons because they simply don’t know what has changed. At the same time, they will not be as knowledgeable when it comes to details, such as how to react in rare emergency situations. Though you may find the first few driving classes stilted and socially uncomfortable, you’ll be exposed to a lot more information. Driving safety school gives real, practical advice on how to behave and what to expect when you’re inside a two-ton vehicle driving 65 mph down the highway. As a result of the school-like learning system, you’re also much more likely to retain what you’ve been taught. In reality, you don’t have to choose between your parents and a certified driving instructor; by attending driving safety school and practicing with your parents at home, you can get the best of both worlds. It has been statistically proven that teens are nearly 10 times more likely to be in a crash, so the more experience you can accrue, the better. Drivers ed is an experience that all drivers — regardless of age — should pursue and enroll in. Going far beyond basic driving lessons and techniques, the beginner driving courses take an in-depth look at what responsible driving really means. From instructional coursework to real videos about real people, drivers ed offers a well-rounded introduction to the sometimes scary and overwhelming reality of driving. If you’re interested in signing your child or yourself up for drivers ed classes, but aren’t familiar with the expectations, you may have quite a few questions. Let’s take a look at the ones that are most commonly asked. What do students need to bring to class? When students come to class for the first time, they’ll need their driver’s permit (if they have one) and a positive attitude. Most other materials will be provided by the driving school unless otherwise specified. As long as students possess a willingness to learn and better their skills, they’ll be fully prepared to begin. Can a student miss one day of drivers ed? If absolutely necessary, missing one class won’t set them too far behind. However, this is not recommended — without constant reinforcement, it can be easy to forget what you’ve just learned, so unless there is an emergency situation, try to make sure your child makes it to every class. When should I schedule in-car driving lessons? Depending on the program you’re enrolled in, in-car lessons are provided. That being said, it’s recommended that your child has 20 hours of driving experience before they begin in-car driving lessons; we want to make sure that they’re comfortable and confident enough to hit the road with someone other than their parent. What can I do as a parent to help? One of the best things parents can do is support what is being learned in school: be a good example and follow the rules of the road, and talk about what your child has learned that day over dinner. If you’re constantly reinforcing positive driving behaviors through both telling and showing, your child will most likely pick them up themselves. If all 214 million licensed drivers in America were required to attend driving school, the roads would be a safer place. Don’t hesitate to get involved in your local drivers ed program; sign your child up for lessons today. Getting your driver’s license is the first big step towards independence and adulthood for many teenagers. However, with great power also comes great responsibility. Being a conscientious and aware driver is important not just for your safety, but for the safety of others on the road too. A shocking number of teenagers report being in a crash — for example, 20% of 11th graders say they were in a crash as a driver in just the last year, and it’s been statistically shown that in their first year on the road, teens are almost ten times as likely to be in a crash as compared to other years. There’s a good reason that car insurance is more expensive for younger drivers. Taking driving classes — either through your school or another program — and considering going to defensive driving school can increase your skills and safety. For those who might live in the country or a small town, driving is usually the way you get anywhere. These drivers report driving over 12,000 miles annually, compared to those who live in a medium-sized town or city (they drive under 10,000 miles every year). Most teenagers living in rural areas likely get their driver’s license as soon as possible, to get to school or work, or to help drive younger siblings around. However, the fatality rate for drivers between the ages of 16 and 19 is four times more than drivers who are between the ages of 25 and 69 years old. Part of this may be that teenagers are simply more distracted — cell phones and other devices blinking and beeping don’t help. And most young people have an invincible attitude towards life and may take more risks than older people — which is great, but not so much when it comes to how they behave on the road. Learning to drive in a driving course or driving school and attending a defensive driving school can make a big difference in how kids handle themselves on the road. What Does Defensive Driving School Cover? Whereas a beginner’s driving course will teach drivers how to actually drive, a defensive driving school covers how to defend yourself on the road. That is — how to react to others around you and defend yourself from bad proclivities, like driving under the influence of alcohol, or driving while tired, stressed out, or mad. They’ll also likely cover crash prevention techniques, look thoroughly at safety equipment and how it can save your life or prevent serious injuries, going over traffic crash statistics, and reviewing your state’s traffic laws. Ideally, a defensive driving school will advise on how to stay out of crash scenarios, but also guide you on what to do if you find yourself in a situation that you think could lead to a crash. For example, if you skid on ice, or see someone veering into your lane, the defensive driving course will give you pointers on how to regain control and avoid a crash. How Much Do Driving Courses or Defensive Driving Schools Cost? Driver’s ed is often covered for free in high school, so that’s one great place to start. However, more advanced driving courses are offered independently and those looking to brush up, or perhaps get a license for Class B or C vehicles, might want to take advantage of these courses. Independent driving schools might cost anywhere between $200 and $800 for a whole package deal. Defensive driving courses are typically much lower, since it’s more of an addendum to your driving skills, not those who need to practice driving. In most states, it’ll cost you between $20 and $25 to take the course, and it might even help lower your car insurance, making it a worthwhile thing to consider. Stay safe on the road, feel confident in your driving, and potentially even reduce your insurance when you take a defensive driving course! It’s certainly worth the money and a few hours out of your weekend.